I’ve been having so much fun putting together various holiday looks over the last few weeks. They’re all special and have something unique about them, but I have to say, this one might be a favorite. If you’ve been wanting to nix the classic holiday party dress and do something a little bit different, I have some ideas for you today! If you’re heading to a more formal holiday party, most women will probably be wearing dresses. I love a good holiday party dress just as much as anyone, but if you want to step outside the box, try a pantsuit like this one from Ann Taylor. The velvet makes it seem much more luxurious and gives it that formal vibe. 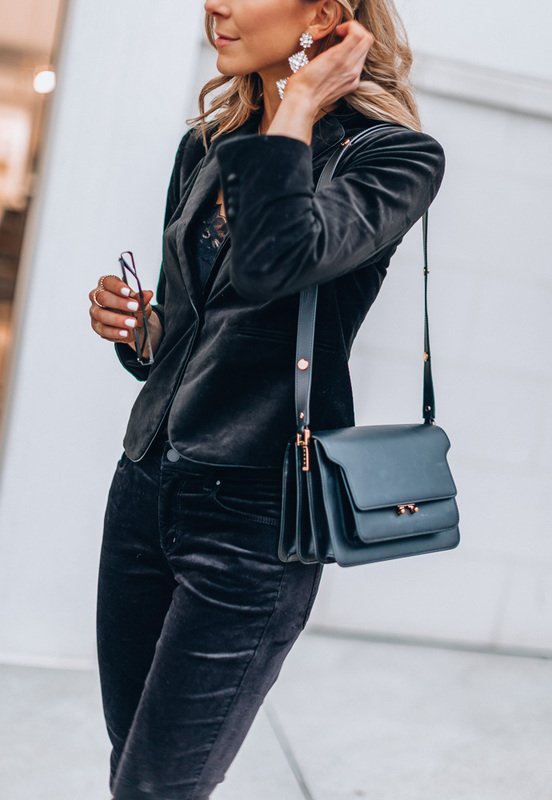 I also love this velvet jumpsuit – so chic and unexpected! If you’re worried a pantsuit might be too casual, elevate the look with your accessories. These statement earrings and jeweled sneakers do just that and I’m obsessed with them. I mean, just look at the sneakers! And the best part is that they’re so comfortable too. Forget wearing a heel when you can just slip into these and look and feel just as great. What are you wearing to the holiday parties on your calendar? Will go classic or a little bit unexpected?